George Lane, a financial analyst from the 1950s is one of the first to publish on the use of stochastic oscillators to forecast prices. According to Lane you use the stochastics indicator with a good knowledge of "Elliot Wave Theory". A Center piece of his teaching is the divergence and convergence of trend lines drawn on stochastics as diverging/converging to trend lines drawn on price cycles. 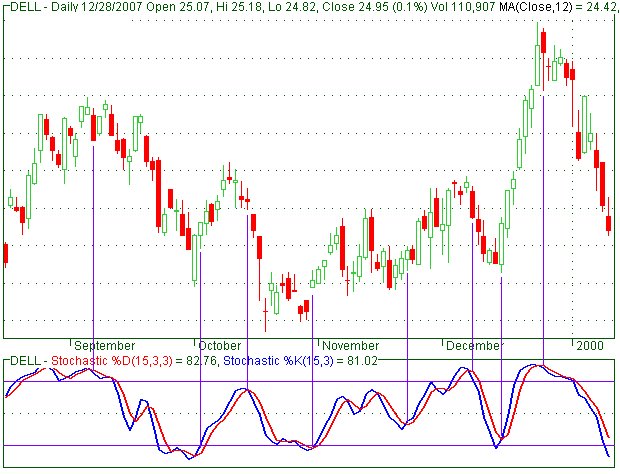 Stochastics has the power to predict tops and bottoms. %D. The method (i.e., Exponential, Simple, Smoothed, or Weighted) that is used to calculate %D. HIGH(n) — is the highest high in n periods. SMA — is the Simple Moving Average. The usual "n" is 14 days but this can be varied. Usually m=3. When the current closing price is the low for the last N-days, the %K value is 0, when the current closing price is a high for the last N-days, %K=100. The idea behind this indicator is that prices tend to close near their past highs in bull markets, and near their lows in bear markets. Transaction signals can be spotted when the stochastic oscillator crosses its moving average. Two stochastic oscillator indicators are typically calculated to assess future variations in prices, a fast (%K) and slow (%D). Comparisons of these statistics are a good indicator of speed at which prices are changing or the Impulse of Price. %K is the same as Williams %R, though on a scale 0 to 100 instead of -100 to 0, but the terminology for the two are kept separate. The %K and %D oscillators range from 0 to 100 and are often visualized using a line plot. Levels near the extremes 100 and 0, for either %K or %D, indicate strength or weakness (respectively) because prices have made or are near new N-day highs or lows. There are two well known methods for using the %K and %D indicators to make decisions about when to buy or sell stocks. 1). The first involves crossing of %K and %D signals. %D acts as a trigger or signal line for %K. A buy signal is given when %K crosses up through %D, or a sell signal when it crosses down through %D. Such crossovers can occur too often, and to avoid repeated whipsaws one can wait for crossovers occurring together with an overbought/oversold pullback, or only after a peak or trough in the %D line. If price volatility is high, a simple moving average of the Stoch %D indicator may be taken. This statistic smoothes out rapid fluctuations in price. 2). The second involves basing buy and sell decisions on the assumption that %K and %D oscillate. Some analysts argue that %K or %D levels above 80 and below 20 can be interpreted as overbought or oversold. On the theory that the prices oscillate, many analysts recommend that buying and selling be timed to the return from these thresholds. In other words, one should buy or sell after a bit of a reversal. Practically, this means that once the price exceeds one of these thresholds, the investor should wait for prices to return through those thresholds (e.g. if the oscillator were to go above 80, the investor waits until it falls below 80 to sell).